Today I am reading in 1 Samuel Chapter 3 where God Calls Samuel. I’ll be following the footnotes as I go. (i) Josephus thought that Samuel was about 12 years of age at this time. (j) Samuel performed both prophetic (1 Samuel 3:19-20) and priestly (1 Samuel 7:9-10; 10:8; 16:2, 5) duties. The footnotes for this one verse took me all through the story of Samuel to show that he was both a prophet and a priest. Samuel kept a right relationship with God and was blessed. Eli and his sons were disrespectful and evil. They did not keep a right relationship with Yahweh, and God was silent. Today I am continuing in 1 Samuel Chapter 3 where God Calls Samuel. I’ll be following the footnotes as I go. Yesterday’s study skipped around the book of 1 Samuel to show that Samuel was both a priest and prophet who had a right relationship with God and was blessed. Today’s study goes back to the first time God spoke to Samuel. Then Eli realized the Yahweh was calling the boy. So Eli told Samuel. The world would tell me that it’s better to act now and ask forgiveness later, but that is not what God wants! He wants me to be obedient to His word – from the start! I leave my study thinking about what Samuel said to God: “I am Your servant, and I am listening.” This is the attitude God wants in me. I can listen to God by dwelling on His word. Deuteronomy 6:6 says: “These words which I am commanding you today will be on your heart. And, you must teach them to your children. Talk about them when you sit in your house, and when you walk on the road, when you lie down, and when you get up.” The first thing I do each morning is plan my day. I need to get up each morning asking myself “How can I serve God today?” and plan accordingly. Today I am continuing in 1 Samuel Chapter 3 where God tells Samuel about what will happen to Eli and his family at Shiloh. I’ll be following the footnotes as I go. The world would pick and choose those parts of the Bible they want to accept. I leave my study today clearly understanding that I need to keep a right relationship with God by being obedient to all of His word that was not done away with in the New Covenant. If I read something in His word that goes against what I am doing, I need to change my heart and my life so that I am in line with His will. Today’s study is about Eli’s reaction to what God told Samuel. This was not an easy conversation for either Samuel or Eli. (d) “My son” was a term of endearment; Eli thought of Samuel as his beloved apprentice. The whole theme of the story of Samuel is one of total dedication toward God. Eli was the old priest, judge, and leader of God’s people. He had been a faithful servant to Yahweh until it came to a decision between obeying God and punishing his own grown sons for their disobedience. Eli did talk to them about what they were doing wrong but did nothing to stop them. He could have removed them from their position of power in the temple but because he didn’t, God counted him guilty just like his sons. Eli was to be punished along with his whole family! Eli put his love of his sons above his love for Yahweh, and was punished for it. 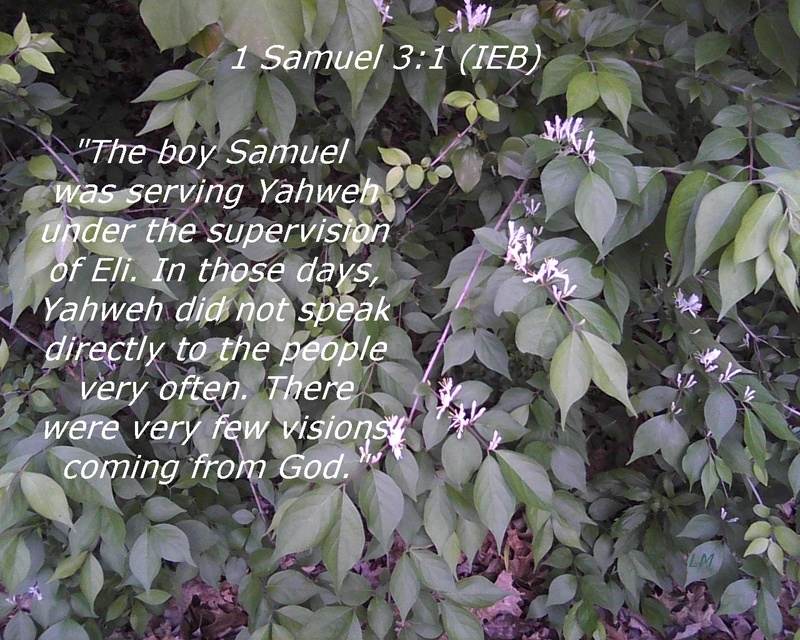 Samuel was faithful to Yahweh and Yahweh blessed him. He appeared to Samuel and revealed Himself to Samuel through His Word. As I leave my study today, I think about all that I see wrong in this world. I realize that it isn’t enough just to know that these things are wrong. God clearly expect me to actually do something about the things I have control over! I’m not in a position of power like Eli, but I do have control over my own choices. I am also free to write to the leaders in this country to remind them of what God’s word says, and encourage them to stand firm on His word so that we will continue to be blessed. Today I am continuing in 1 Samuel, starting in chapter 4. The Israelites are fighting the Philistines. At this time Samuel spoke to all Israel. The fact that the elders wanted the Holy Chest of the Covenant with them at the battle showed their ignorance of its significance. They were unwilling to listen to God but wanted the place where He would speak to them with them. That’s like carrying the bible everywhere I go but refusing to read it. The army had sent men to Shiloh to get the Holy Chest of God. When the Holy Chest of the Covenant came into the camp the Israelites gave a great shout and the Philistines wondered what had happened. Eli’s two sons Hophni and Phinehas were there in the camp with the chest. I think it is interesting that Hophni and Phinehas were the ones to remove the Holy Chest of the Covenant out of the Holy Tent-temple and take it to the battle site. They were so entrenched in their sinful practices that they ignored God’s instruction to keep exactly to His pattern which was to keep the Holy Chest of the Covenant in the Holy Tent. The Holy Chest of the Covenant was where God spoke to the Israelites. Since they had stopped listening to God, they treated the Holy Chest as merely a “good luck” charm, and God did not protect them from consequences of the choice they made. I leave my study today examining my reverence for; God, the sacrifice that Christ made so that my sins could be forgiven, and the gift of God’s word. Do I long to be His servant, to be obedient to all of His commands, or am I treating my baptism as a “good luck” charm, and God as someone to be call on only when I want or need something? The Philistines had defeated the Israelites and captured the Holy Chest of the Covenant. 1 Samuel 4:12-18 (IEB): “That same day, a man from the tribe of Benjamin ran away from the battle-line. (a) He came to Shiloh. He tore his clothes and put dust on his head. (b) When the Benjaminite man arrived at Shiloh, look Eli was there, sitting on his chair, facing the road. He was worried about the Holy Chest of the one true God. When the Benjaminite man entered Shiloh, he reported the bad news. Then, all the people in town cried out. I leave my Bible study today trying to imagine the despair Eli must have felt – after 40 years of leading the Israelites to have it end in such dishonor and disaster! God had already told him that no sacrifice he could make would cleanse his sin against God. I am thankful to God for sending His Son to die as the only perfect sacrifice for sin, once and for all. I am grateful for the opportunity to accept the gospel and be baptized into Jesus Christ, and for His written word which guides me in a right relationship with Him. But most of all I am thankful for the opportunity to repent and to be forgiven with the promise of eternal life with God.